Burning Building Comix #5 is done! Yes, the last issue of the series is pencilled and inked, and just needs to be put together. It's very exciting for me to finally be done. Friends have already asked if I'm sad that it's done, and the answer is NO! Not that I don't like working on the series, but I'm excited to get it done and get it out there in the world, and to move on to a new project. I'm not sure what that will be as of yet, but I have a bunch of ideas in the hopper, so I probably won't wait too long before starting up something new. Also, I wanted to point out that you can see a short comic of mine in a new 'zine. It's about mustaches, and is edited by the talented Sarah Morean. 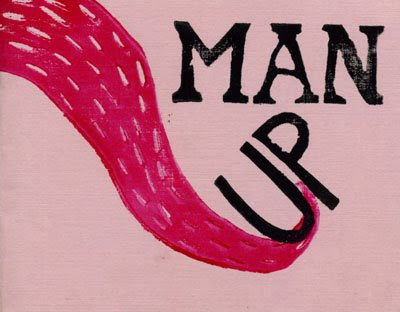 It's called Man-up and you can buy it from Sarah here. Sarah did a great job, and you can find mustache related stories from a large group of people, including Jeff Brown and Tim Sievert. So keeping with the theme of my last entry, I thought I'd put up some of the articles that have been written on myself and the gallery in the last couple of weeks. It's been a great experience having the gallery show, and I've been very lucky to have very nice people write some very nice articles about me and the show. Elliot Serrano wrote a great article for the Red eye that you can read below, and also posted the entire audio from our interview on his blog in the link below that. And if you want to hear something strange, Elliot hosts a web series on comics with a former co-worker of mine from my time working at the Comix Revolution. Small world huh? You can see Jose and Elliot for yourself here, and you might be able to see me join them, as I've been offered an open invitation. Then I was interviewed for the Pioneer Press by Myrna Petlicki. This was a nice full page article in all the papers last Thursday. I was very happy with it, and Myrna did her homework and even read this blog! So thanks to everyone for helping me out in getting the word about my comics out there. OH! I almost forgot another event to mention. Next month I'll be travelling out to Missouri to participate in a panel about young comic artists. It's hosted by the library at the University of Missouri and is celebrating the 75th anniversary of the comic strip Alley Oop. You can find all the information about the events here. Apparently Alley Oop creator V.T. Hamlin held a bunch of different jobs before the success of Alley Oop, and the panel will focus on the trails of becoming a cartoonist, and the jobs you have to take in the meantime. More info on that as it approaches.